The Church of St. Nicholas of Japan in Brixton, Johannesburg, in South Africa is missionary parish under the jurisdiction of the Church of Alexandria. The parish celebrated its twenty-fifth anniversary in 2012. The parish had its origins as a mission of the Society of St. Nicholas of Japan in Fairmount, Johannesburg which had its first public service, a Vespers, on October 24, 1987 in St. Matthew’s Anglican Church Hall. At that time the society hoped to start several new parishes. As the mission expanded, services were moved in March 1988 to a chapel at St. Martin’s-in-the-Veld Anglican Church in Dunkeld, a suburb of Johannesburg. The facilities at these locations had been temporary and required a setup and take down for each service. In 1990, the mission moved to a chapel at the Russian House in Yeoville, Johannesburg where the ecclesiastical service facilities could remain in place. As it grew, the congregation decided to form itself into a parish, adopting St. Nicholas of Japan as its patron. In a move away from the concept of ethnic communities, functioning more or less as ethnic chaplaincies, the parish of St. Nicholas intended to be a multi-ethnic mission church, with services conducted mainly in English. St. Nicholas of Japan was chosen as the patron saint because, as a Russian missionary, he went to Japan to start a church for the Japanese, not a Russian one. Thus, the aim of the society and the new parish of St. Nicholas was to be a Orthodox Church for South Africans, one in which people of any ethnic background could join. With this missionary intent in mind an elected parish council was formed separate from the committee of the mission society. Now a parish, the council looked for a more permanent place to meet. 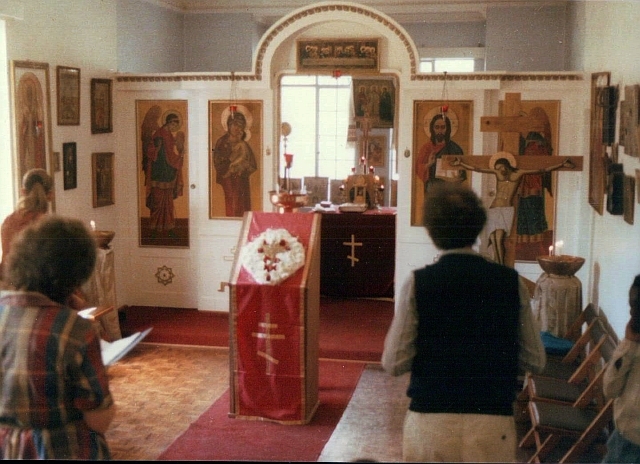 In November 1990, the parish began services at the Brixton Tabernacle, formerly the Full Gospel Church, that had been acquired and altered to make it suitable for Orthodox worship. In the new home, a steady stream of people began to join the Orthodox Church at St. Nicholas parish in Brixton. On Sunday morning, October 14, 2012, in celebration of the twenty-fifth anniversary of the founding of the parish, Archbishop Damaskinos of Johannesburg and Pretoria served a hierarchical Divine Liturgy that included tonsuring several readers and blessing the altar servers. As a multi-ethnic parish St. Nicholas has drawn on many customs from different parts of the Orthodox world. On Holy Thursday and Good Friday the parish has adopted the Greek custom of the bringing out and the taking down the cross. At Pascha, the Russian style Easter kiss is observed. Also, the Serbian custom of the Slava is observed, as it fits well with the understanding of the importance of ancestors in many areas of Africa. This page was last edited on December 20, 2012, at 10:57. This page has been accessed 4,812 times.